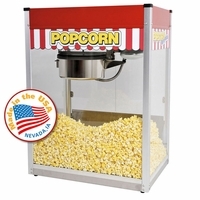 Popcorn Carts and Stands are a simple and effective solution for fitting a bulky popcorn machine in your home theater. Not only do they provide a good looking and efficient place to store your popcorn machines and condiments, but the whole setup can be easily wheeled away when not in use. Most Popcorn Carts can even be folded down and tucked away themselves, then easily set up again to impress your guests on movie night. The benefits of owning a Popcorn Cart or Stand are countless, and at such at such affordable prices it's easier than ever to enjoy the convenience offered for your popcorn machine setup. If you don't have a popcorn machine yet, check out our wide selection of 4oz Poppers and 8oz, 12oz, and 16oz Popcorn Machines here!